Al Qaeda Orders Muslims to Leave US Before Nuclear Terror Strike! My Vast Right Wing Conspiracy sends more news of a Nuclear Terror threat against the United States! 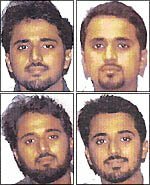 Be on the look out for this Al Qaeda terrorist, Adnan G. El Shukrijumah, who lived in the US for several years. There is a $5 million reward for information on his whereabouts. * Final preparations have been made for the American Hiroshima, a major attack on the U. S.
* Muslims living in the United States should leave the country without further warning. * The attack will be commandeered by Adnan el Shukrijumah (“Jaffer Tayyer” or “Jafer the Pilot”), a naturalized American citizen, who was raised in Brooklyn and educated in southern Florida. * The al Qaeda operatives who will launch this attack are awaiting final orders. They remain in place in cities throughout the country. Many are masquerading as Christians and have adopted Christian names. My Vast Right Wing Conspiracy has more on this latest news. There was much written about Adnan G. El Shukrijumah HERE, HERE, HERE this week. He may have been spotted in Texas earlier in the year as reported HERE. Adnan G. El Shukrijumah, the suspected nuclear terrorist mentioned in warning reports from Pakistan earlier in the week, is shown here in video. Adnan is giving a presentation regarding how to jump start a car for a class in “English as a Second Language”. Adnan G. El Shukrijumah may have successfully smuggled nuclear material across the US border and is planning an attack on the United States. Lifeboat Foundation has a terrific roundup on the “Nuclear Terrorist” – Adnan Shukrijumah. Remarks: El Shukrijumah occasionally wears a beard. He has a pronounced nose and is asthmatic. El Shukrijumah speaks English and carries a Guyanese passport, but may attempt to enter the United States with a Saudi, Canadian, or Trinidadian passport. Holy Texas Nuke Terrorist! Adnan Jumaa May Have Been Spotted! Found: Video of “Nuclear Terrorist” Adnan Shukrijumah!